BEIJING (Reuters) - Tesla Inc has signed an agreement with the Shanghai government for an 860,000 square metre plot of land to build its first overseas Gigafactory, the electric carmaker said in a Chinese social media post on Wednesday. The land agreement marks a key step towards the firm and its Chief Executive Elon Musk making cars locally in China for the fast-growing market, even as tariffs imposed by Beijing on U.S.-made goods have caused it to hike prices of its imported models. Tesla signed a long-anticipated deal with Shanghai authorities in July to build its first factory outside the United States, which would double the size of its global manufacturing and help lower the pricetag of Tesla cars sold in the world's largest auto market. "Securing this site in Shanghai, Tesla's first Gigafactory outside of the United States, is an important milestone for what will be our next advanced, sustainably developed manufacturing site," Robin Ren, Tesla's vice president of worldwide sales, said in a statement. 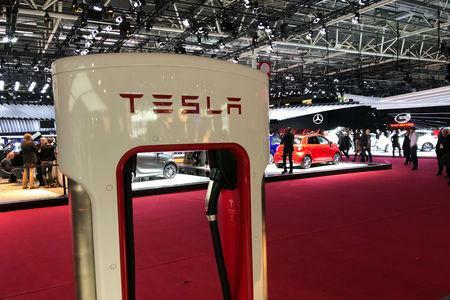 Tesla did not give the price tag for the plot, but the Shanghai Bureau of Planning and Land Resources said on Wednesday that a plot of land of 864,885 square metres had been sold at auction at a price of 973 million yuan ($140.51 million). Tesla signed a deal with Shanghai authorities in July to open a plant in the Chinese city with an annual capacity of 500,000 cars. The factory will help tap China's rapidly growing market for so-called new-energy vehicles (NEVs), a category comprising electric battery cars and plug-in electric hybrid vehicles, even as China's wider car market cools. NEV sales were up 54.8 percent in September and climbed 81.1 percent in the first nine months of this year to 721,000 vehicles, the country's top automobile industry association said last week. Beijing, however, is reining in subsidies for the sector, concerned about overcapacity and "blind development," with many inside the industry expecting a shake-out to hit the wide array of smaller local electric car start-ups. Tesla, which started hiring for the new Shanghai factory in August, previously said that it would raise capital from Asian debt markets to fund the construction, which will cost around $2 billion.